Mon., Nov. 28, 2016, 5:22 p.m.
WASHINGTON – Talk about a guy who knows how to parallel park. On Monday morning, Gary Amoth backed his 105-foot-long red truck next to the sidewalk of the west lawn of the U.S. Capitol and dropped off a very special delivery: a monster-sized Christmas tree from Idaho’s Payette National Forest. 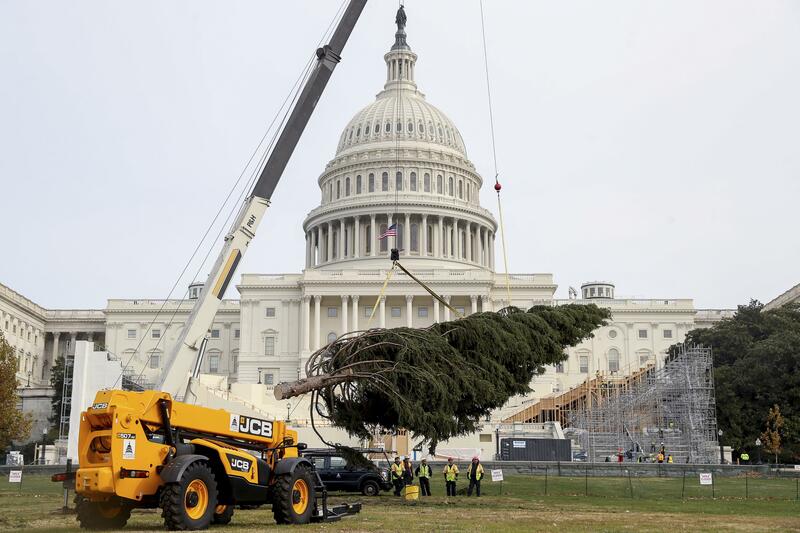 The 84-year-old Engelmann spruce stood 80 feet tall after a crane hoisted it in place on the lawn of the Capitol, where it will be decorated with LED lights and 6,000 ornaments made from recycled materials by Idaho schoolchildren. Amoth, a trucker from Twin Falls, Idaho, drove into the city in the dark and got to see the nation’s capital for the first time as day broke. Amoth’s final stop in Washington was the 31st since the tree left Idaho on Nov. 5, a journey that attracted tens of thousands of spectators along the way. The tree was accompanied by two law enforcement vehicles, with officers stopping along the way to block traffic to allow the truck to pass through, and one forest service vehicle. Workers cut the 2016 Capitol Christmas tree from Little Tree Ski Hill, west of McCall, Idaho, on Nov. 2. “I can’t believe we’re finally here,” said Keith Lannom, supervisor of the Payette National Forest, who joined the group in Nashville, Tennessee, to make the trip into Washington. Lannom said one of the biggest challenges during the cross-country trek was just keeping the tree watered. “The tree was drinking about 20 gallons of water every day,” he said. During a brief welcoming ceremony, Stephen Ayers, architect of the Capitol, noted that the tree came from “the great state of Idaho.” He thanked members of the Idaho congressional delegation, none of whom attended. “I accept the 2016 Capitol Christmas tree on behalf of the United States Congress,” Ayers said. The tree will be lit at 5 p.m. on Dec. 6 by House Speaker Paul Ryan, R-Wisconsin. Ryan will be assisted by Isabella Gerard, a fifth-grade student at Boise’s St. Mary’s Catholic School, who won the honor after writing a poem titled “Pristine Idaho Mountains.” She’s expected to arrive in Washington with her family later this week. And just for the record: The Capitol Christmas tree is not to be confused with the National Christmas Tree, which is lit each year on the Ellipse near the White House. This year, President Barack Obama will light the tree on Thursday, the last time he gets to flip the switch before leaving office. Published: Nov. 28, 2016, 5:22 p.m.